Will Indian cities heed a global wake-up call at least now? This year’s air pollution list is unprecedented, with 14 Indian cities ranked as the most contaminated among the top 15 international urban centres in the WHO database comprising 4,300 hotspots. Kanpur tops the list with the highest concentration of PM 2.5, according to information from the World Health Organisation (WHO). It is followed by Faridabad, Varanasi, Gaya, Patna, Delhi, Lucknow, Agra, Muzaffarpur, Srinagar, Gurgaon, Jaipur, Patiala and Jodhpur. PM2.5 refers to fine inhale-able particle pollutants that have diameters of 2.5 micrometres or smaller. These are comprised of microscopic solids or liquid droplets that are so small that they can enter the lungs and the blood stream easily and cause serious health problems. Every year, there are about seven million people globally who die due to respiratory and cardiovascular diseases caused by exposure to PM2.5 pollutants. The WHO report for 2016 brings out several hard-hitting and clear facts with respect to air pollution in India. Fourteen Indian cities are the most polluted in the global list of 20. 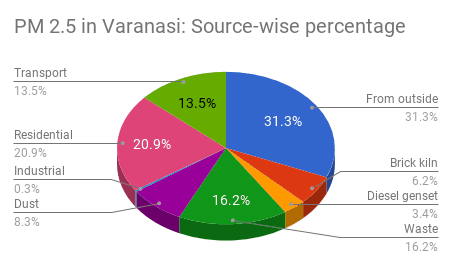 Kanpur tops the list, while Varanasi is third and Delhi is the sixth. About nine out of 10 persons in India breathe the most polluted air. The main sources of air pollution from particulate matter, ie sulphate, nitrate and black carbon, are said to arise from “inefficient use of energy”. Air pollution causes one-quarter, or 24 percent of adult deaths from heart disease, 25 per cent from stroke, 43 per cent from chronic obstructive pulmonary disease and 29 per cent from lung cancer. Pollutants are released in households, industry, agriculture, transport sectors as well as coal-fired power plants. Sand and desert dust, waste burning and deforestation too cause air pollution. The poorest and most marginalized sections are threatened the most. Let us take a look at WHO’s five most polluted cities in India and what causes them to make it to the hall of shame. Examining the causes and available information on pollution in these cities could point to some solutions. Other recommendations: Five monitors, water-sprinklers, increasing urban train service, battery-operated transport and more tree plantations. Hit by multiple diseases such as bronchial asthma, chronic obstructive pulmonary disease and pneumonia, this city in Uttar Pradesh is said to have tripled its number of patients with respiratory illnesses to more than 600 a month, many of whom are children and over-50 citizens. The heavy pollution has contributed to the city’s health hazards. 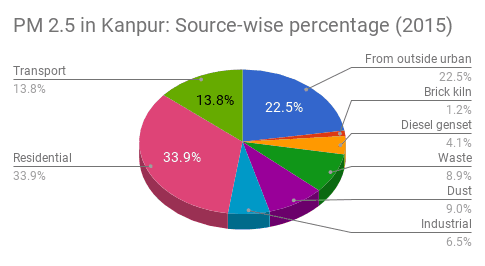 But what exactly makes Kanpur the leader in the pack, with its annual mean PM 2.5 being 173 micrograms per cubic metre? To begin with, the city needs to upgrade the basic, fundamental equipment that can help identify its pollutants. Big cities like Kanpur need five stations to track PM 2.5, according to a state health official. But it has only one monitor, which is situated in a busy marketplace in the centre. In this industrial city, winter is particularly severe, with particulate matter such as dust and soot contributing 76 per cent of the pollution, according to a 2015 report by the city’s Indian Institute of Technology (IIT). Other pollutants emanate from biomass burning that make for 15 per cent of the emissions, and vehicles contribute 8 per cent. Other sources also include coal burning and tanneries, which release chromium. Small and medium industries also contribute to the pollution. However, summer shows a decline in burning, with both particulate matter and vehicular emissions contributing equally, at 35 per cent each, to air quality. The WHO report has given the central environment ministry a jolt. The ministry is thinking of investing Rs. 700 crore this year so that it can increase air-quality monitoring systems as well as water-sprinklers to fight dust. Other measures could be improving urban development, more LPG connections, improving road infrastructure to reduce road dust re-suspension, urban train services, battery-operated transport and more tree plantations. Sources of pollution: Vehicles, construction dust, burning of municipal solid waste, electroplating units, smoke-emitting industries. Other recommendations: Not permitting registrations of diesel vehicles of more than 10 years, directing housing welfare boards to contain dust during construction. The second most polluted city is Faridabad in Haryana. Its annual mean PM 2.5 was recorded to be 172 micrograms per cubic metre in 2016. Faridabad’s source of pollution is its vehicular pollution, construction dust and burning of municipal solid waste in nearby Delhi. Even electroplating units and smoke-emitting industries with small chimneys lead to pollutants. Most residents complain that the quality of air, water, garbage disposal, noise, light, parks and tree plantations is very poor. However, Environment and Climate Change Minister, Vipul Goel, refutes the WHO report. He points out that the source of the data on which the report is based is unclear. The state control board has been regularly monitoring the data since 2010, through the Continuous Air Ambient Quality Monitoring Station. The PM 2.5 value is also being checked regularly since 2013, he adds. While the WHO claims that the PM 2.5 level in Faridabad is above 170, the state minister counters it saying that it is only during a few days during Diwali, the crop harvesting season, when the pollution rate hovers above 170. That is when “residue burning” happens during peak winter, mainly due to low temperature and minimum wind velocity. Hence, he said it was unfair to peg the average PM 2.5 value of Faridabad at above 170. Measures to fight pollution undertaken by the government include disallowing registrations of diesel vehicles of more than 10 years, and directing housing welfare boards to contain dust during construction activities. Varanasi, the constituency of the Prime Minister Narendra Modi, has been found to have PM 2.5 concentration of 151 micrograms per cubic metre. It is the third most polluted city in the world, according to the latest WHO report. There is just one monitoring station in Varanasi, and that too has been found to have “huge gaps” in the information. The reasons for pollution in Varanasi are much the same as in other north Indian cities – dust and emissions from traffic, industry and construction, smoke from private diesel generators, open fires, biomass burning, coal-powered plants and deforestation. The APnA City Program study in 2015 reports that domestic cooking and heating, transport (including on-road dust), brick kilns and open waste burning are key sources. About 31 per cent of the ambient annual PM2.5 pollution is due to pollutants outside the urban airshed. A 2012 report by IIT, Delhi, reveals that data on aerosols, nitrogen and sulphur oxides lead to increased particulate matter and asthma, chronic lung and heart diseases. Medical experts confirm that complex weather patterns have led to a 20-25% increase in chest infection and bronchial allergies in the last 4-5 years, while children’s respiratory diseases became eight-fold in the last two decades. 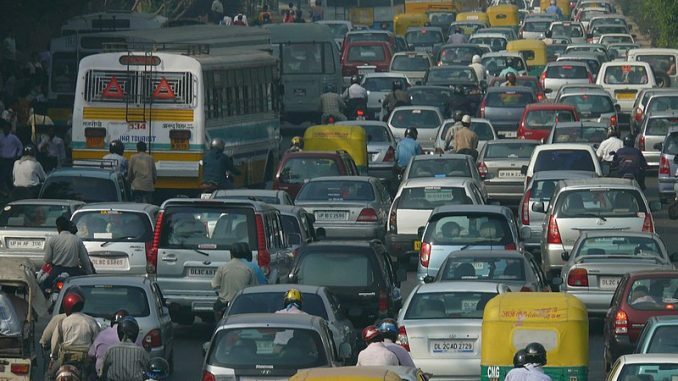 Crores have been spent to reduce traffic and dust, but it hasn’t helped the city. APnA suggests that air pollution control policies in the Indo-Gangetic plain call for a “regional outlook”. Public and non-motorised transport, improving the road infrastructure and reducing on-road dust re-suspension will be great measures to improve the city. The next two most polluted cities in India are in Bihar. Gaya is the fourth most polluted city, with its annual mean PM 2.5 concentration being 149 per cubic metre. Even though it is a non-industrial town, lack of sewers, poor water supply and weak pollution control monitors have transformed Gaya into another awful air trap. The lack of clean cooking fuels as well as alternative technologies compounds the problem. The Bihar State Pollution Control Board (BSPCB) chairman, Dr Ashok Kumar Ghosh, is however not completely convinced by the data on which the WHO report is based. He is unsure as to why a city has been called polluted only on the basis of data related to just one parameter, ie PM 2.5. He avers that it is not fair to leave out air pollutants such as carbon monoxide, ozone and petrol emission, among others. However, alarmed at the ranking, the District Magistrate has asked the pollution control board to collate the information and also spell out ways to check the pollutants. Other recommendations: Increase plantations near rivers, decrease vehicular pollution. The fifth most polluted city in the country is the state capital of Patna, whose PM 2.5 concentration is 144 micrograms per cubic metre. Patna’s air quality has deteriorated over the years, because it was in the 48th position among 1,600 cities in the WHO database on urban outdoor air pollution. That report was released in 2014, when the city was said to be the second most polluted in the country after New Delhi in 2014. However, today, Patna is the fifth most polluted city in the world. The main reasons for the poor quality of air in the city are suspended road dust particles, vehicular emission and smoke from brick kilns. These have been connected with PM 10, a different level of respiratory suspended particulate matter. Outdoor air pollution has been called carcinogenic, or cancer-causing, by WHO in October 2013. Dr Subhash C Jha, from the TB and Chest department of the Patna Medical College and Hospital, says that patients exposed to pollutants tend to suffer from tonsillitis, allergic pharyngitis and bronchitis. In order to curb air pollution, the state pollution control board claims that it is working with the forest department to take forward plantations on the banks of the Ganga. It would help to prevent the alluvial topsoil from being exposed, even as the Ganga moves towards the north, thus controlling dust pollution. There are strict vehicle pollution checks being implemented through some testing centres at petrol pumps. The board explains that almost 80% brick kilns have initiated green technology with much lower emission levels. The WHO ranking is worrying on several counts. Anumita Roy Chowdhury, head of the Centre for Science and Environment (CSE)’s Clean Air Campaign points out that in 2013, four Indian cities were among the top 20 most polluted international cities. In 2014, the tally was five cities and in 2015 it became seven. But now, it has doubled to 14 cities. Efforts in India to understand the extent of the problem is awfully weak. An interesting “Air Pollution Knowledge Assessment” city program, or APnA, designed in 2015, gives interesting insights into assessing the extent and source of air contamination in various cities. They have found that the factors for pollution have not been studied or understood in second-tier towns or areas. monoxide (CO), non-methane volatile organic compounds (NMVOCs) and carbon dioxide (CO2). Particulate matter (PM) is understood in four bins (a) coarse PM with size fraction between 2.5 and 10 μm (b) fine PM with size fraction less than 2.5 μμm (c) black carbon and (d) organic carbon. The numbers are tabulated for for 2015, and projected for 2030. The Central Pollution Control Board (CPCB) has been measuring pollutants to arrive at an Air Quality Index (AQI) daily for every city. It varies everyday depending on the season and the range of difference. The AQI factors eight pollutants: PM10, PM2.5, NO2, SO2, CO, O3, NH3 and Pb. On November 17, 2017, the city with the worst Air Quality Index (AQI) happened to be Varanasi. The AQI was found to be 491 at Ardhali Bazar monitoring station — just about nine short of the “public health emergency” limit of 500. The pattern is so clear that it stares us in the face. Clearly, we haven’t heeded signals. If we don’t act fast, we are looking at worsening an already grave national crisis. Need educated, aware politicians who understand the magnitude of the problem. That north indian cities alone figure in worst polluted says a lot about governance in that part of the country.